Lots of interesting and unique ideas are happening in young adult sci-fi and fantasy right now, and when the author can pull them off while being diversity-minded and still nail the trifecta of characters, story, and world-building, it can be incredible thing to see. However, I’ve also found these cases to be extremely rare. To wit, I’ve lost track of the number of times I’ve come across a book with amazing representation and great ideas, only to have everything else be a convoluted and fractured mess. And it pains me greatly to admit that this was similar to what I found with Once & Future by Amy Rose Capetta and Cori McCarthy. Credit where credit is due though, I have to say this was one of the most ambitious YA novels I’ve read in years. 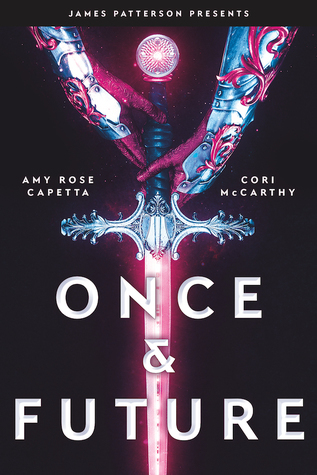 When I first heard about a gender-bending queer retelling of the King Arthur legend in space, I knew I had to read it, but I was also curious to see how it would be done. As it turns out, the answer is a doomed cycle and some nebulous form of reincarnation. In a nutshell, this means that all the characters of the Arthurian legend have come back again and again in one form or another, ever since the time of the first Arthur. So now far into the future, in a universe ruled by an evil megacorp called Mercer, we get to meet our 42nd reincarnation of the great king, who is a determined teenage girl name Ari. Cut off from her home planet of Ketchan, which has been barricaded off by Mercer, Ari finds herself constantly on the run with her brother Kay to avoid being captured. Then one day, she crash-lands on Old Earth and finds an ancient sword among its ruins. You know the rest of the story: the chosen one, awakened when the world is at its greatest need for heroes. In due course, Ari rallies a group of loyal knights to her cause, including Lam, Val, and Jordan, and even finds her queen Gwen, the ruler of the medieval recreation planet Lionel. Of course, we also mustn’t forget Merlin, the man of myth and magic. And here’s where things get a little weirder. Cursed to age backwards reliving the tragic story of King Arthur over and over, this iteration of Merlin emerges from his crystal cave the moment Ari draws the old sword, looking younger than ever before. Fearing what would happen if he fails his liege this time, Merlin places his last desperate hopes on Ari, who granted isn’t the Arthur he expected, but might turn out be the one to finally break the vicious cycle. I’ll give Once & Future this: considering all the elements the authors had to pull together to make this work, the ideas behind the book are surprisingly well realized and great fun. I also didn’t think I would enjoy the style of humor, but I did. Offbeat but not too silly, the jokes and playful banter actually helped make this novel a smoother ride and more enjoyable. That said though, I found most of everything else to be a struggle, especially the story. Despite the high stakes, there’s a distinct lack of depth to any of our characters’ actions because all the plot points involved are so shallow and simplistic. In a way, I suspect this might in fact be a side effect of the world-building, which I also felt was flimsy and superficial and even a bit goofy—though on this point, I am less sure whether or not this is by design. We seem to be constantly waffling back and forth between a serious space opera in which our characters deal with some pretty grave matters versus an over-the-top sci-fi comedy where the lines between retelling and straight-up parody are being blurred. As a reader, I found this split incredibly jarring and difficult to engage with. Furthermore, after the first quarter of the book, we started to run out of things to feel excited about. Don’t get me wrong, I loved the refreshing diversity of our characters and the representation in the novel, but like I always say, a gesture like this is diminished if everything else—story, characters, world-building, etc.—isn’t tightly written. And indeed, a lot of these elements fell a bit short. The pacing was haphazard, with examples like our characters becoming best buds in an eyeblink, or time jumps being handled less than ideally. The plot, which started off being so promising and chockful of all these wildly creative ideas became progressively less interesting as the story retreated back to more familiar territory with regards to aspects of the King Arthur legend. Ironically, I think it’s the reincarnation angle that’s the most intriguing but also the most restrictive feature of this story. Here is a retelling of the Arthurian legend in space where the possibilities are essentially limitless. However, because of the direction the authors have chosen, we’re locked into the same patterns that we’ve seen countless times before, superimposed upon a typical YA dystopian tale of oppression and resistance, reskinned with a sci-fi setting with planets and spaceships. Ultimately, I believe Once & Future was a case of many well-developed ideas and themes that sadly did not come together as well as they could have. Taken individually, I loved many aspects of this book, including the central premise and diverse characters, but presented as a whole, the experience somehow felt empty and unfulfilling. I’d say this novel is still worth the read for the things it does well, but at the same time, be prepared for the things it doesn’t. Great review! I’ve been really looking forward to reading this book! Choosing the right tone for a book and sticking to it should be one of the priorities for a writer, I think: having encountered more than once this kind of book, that does not know whether to be funny or serious, whether to portray drama or parody, I can very well understand your frustration with this. You nailed it with your first sentence! And perhaps not surprisingly, inconsistent tone tends to be a problem with a lot of collaborations, I find. Almost as if the authors can’t agree or are having trouble striking the right balance. I wonder if it’s that’s the case here. Given that Merlin ages backward, and hence can remember the future but is very unclear about the past, shouldn’t space-Merlin be fixing his/her FIRST desparate hope on Ari? Since he/she doesn’t know that the historical Arthus is going to (/to us, already has) fail? Is it just Arthur that’s gender-swapped? Guinevere, Morgan, Morgause, still women? Lancelot, still a man? maddalena: so much. It’s often a trait of first-time novelists, I think, who haven’t discovered their talents yet and try to have a go at everything. Although it’s also I suspect an inherent danger of YA, which frequently tries to adopt a cool, teenage cynicism (hence comedy) while at the same time trying to have meaningful emotional investment in the very same tropes that it’s being cynical about. I guess authors look at people like Terry Pratchett and think “well that looks easy”. And of course it’s also the default tone for a lot of popular cinema now, including the whole MCU. The problem is, cinema has the advantages of brevity and of immediate physical impact – a funny enough sight-gag or an awesome enough explosion, or good enough emotional acting, can force one tone to succeed even where it ‘shouldn’t’. It’s much harder to carry that trick off when you only have words to help you, and when you’re trying to sustain it over days, rather than just two hours. And most writers aren’t Pratchett. Haha, it was just very bizarre, but maybe I just did a poor job of explaining in my summary of the book, lol! So basically the premise is that everyone from the Arthurian “legend” was real, and they all keep reincarnating over and over, so now Ari is the 42nd iteration. Merlin is the only one who isn’t reborn, he just seems to become trapped in his cave every time a version of Arthur fails, but wakes up again once the next Arthur pulls the sword – all the while aging backwards. This means 41 times he’s failed and seen the tragic story replay itself in one doomed variation or another, and yet each time he still tries his best to “save” Arthur and break the cycle. He’s afraid that if he fails with the current incarnation, Ari, that the next time he wakes up in his cave he would be a child and eventually become so young he would not be able to help his Arthurs anymore, hence Ari was his last hope. Ah, so they’ve misunderstood the ‘aging backward’ idea, then? I had high hopes for this, but most of the reviews I’ve seen are similar to yours. It seems like this idea could have been better developed by a more seasoned writer, maybe. The whole “aging backwards” idea was brilliantly pulled off in Dan Simmons in Fall of Hyperion, so for me it would be hard to top! Yeah, I’m not surprised at all the three-star and so-so reviews, to be honest. I read a few after I wrote mine, and so many of them seem to hit on the same things. The premise is interesting and sounds a lot like comic Camelot 3000 which is also set in space and has gender swapped Tristan (with female Isolde). Too bad that this book has such a problem with tone. Interesting! I’ve never heard of Camelot 3000, but now you have me intrigued, I’m going to have to look it up. The idea of this book sounds so good! I mean gender-bend King arthur in space?! But I keep seeing these emdiocre reviews, so I’m not sure if I will end up picking this one up.. Agreed, I LOVED the idea! It sounds like this first-time author was extremely ambitious – and couldn’t quite deliver on the premise. A shame – thank you for an excellent and fair-minded review! That is a shame. It’s a pity the tone was so inconsistent. Your description sounds like this is almost supposed to be odd-balled humour and yet at other times that doesn’t ring true.